CNN Article – The footage is grainy and has a video-game aesthetic. But it soon becomes terrifyingly obvious that what is being filmed here is not a work of fiction. The video, which has not been verified by CNN, appears to show an unseen attacker opening fire on worshippers in a mosque, as if they were targets in a game.It seems that the video was filmed by a perpetrator of the mass shootings at two mosques in the city of Christchurch, New Zealand, in which dozens of people were killed and injured. In a sickening angle to an already horrific story, it was live-streamed online.In fact, the entire attack seemed orchestrated for the social media age. Before it took place, a post on the anonymous message board 8chan — a particularly lawless forum that often features racist and extremist posts — seemed to preview the horror. It linked out to an 87-page manifesto filled with anti-immigrant and anti-Muslim ideas, and directed users to a Facebook page that hosted the live stream. Posts on Twitter also appeared to herald the attack. Facebook eventually took down the page and Twitter deleted the alleged perpetrator’s profile; but not before the video had spread like wildfire across social media.The attacks took place in the apparently unlikely location of Christchurch, New Zealand, still struggling to recover after a devastating earthquake that brought down thousands of buildings and killed nearly 200 people in 2011. The city’s population fell sharply after that event. The exodus was largely replenished by migrants, many hired to help rebuild the city. New Zealand Prime Minister Jacinda Ardern said after the shootings that “many of those who will have been directly affected” were likely migrants or refugees.But this attack was about far more than that influx in Christchurch. This was about the rise of white supremacy online and the power of social media in spreading that message. At first glance, the shooter’s “manifesto” seems to recall those of previous white nationalist killers such as Anders Breivik, a far-right terrorist who committed the 2011 Norway attacks. Indeed, the writer references Breivik.But this document is distinctive in being riddled with sarcastic language, deliberate red herrings and allusions to online meme culture, suggesting an internet-driven evolution of nationalist hatred. 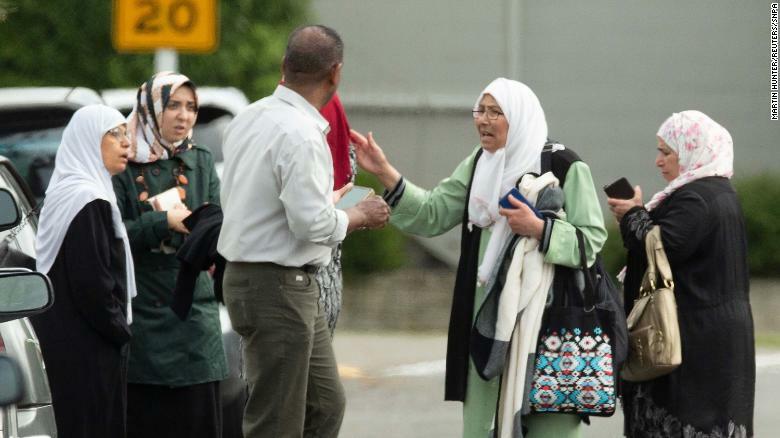 Family members after a shooting at the Al Noor mosque in Christchurch.In a widely shared article on the Bellingcat website Friday, the journalist Robert Evans notes that the document contains many white supremacist reference points that are likely accurate representations of the shooter’s views.”But this manifesto is a trap itself, laid for journalists searching for the meaning behind this horrific crime,” Evans adds. “There is truth in there, and valuable clues to the shooter’s radicalization, but it is buried beneath a great deal of, for lack of a better word, ‘shitposting’.”In other words, the whole thing could be described as one big exercise in murderous trolling.Take another example. Before the attack, the gunman told his online viewers to subscribe to the YouTube channel of PewDiePie, who has 89 million followers on the platform. PewDiePie, a Swedish gaming YouTuber whose real name is Felix Kjellberg, has in the past promoted alt-right themes and attracted criticism for lauding an anti-Semitic YouTube channel.The reference to Kjellberg had a dual effect, writes Elizabeth Lopatto on The Verge. Kjellberg, had little choice but to disown the Christchurch attacks. “Just heard news of the devastating reports from New Zealand Christchurch. I feel absolutely sickened having my name uttered by this person. My heart and thoughts go out to the victims, families and everyone affected by this tragedy,” he posted on Twitter to his 17 million followers. But in deflecting potential criticism for inspiring the atrocity, he is forced to draw attention to it, Lopatto says. If any of his 17 million followers had missed the shootings before his post, they were very much aware of them after it, she writes.Lee Jarvis, co-editor of the journal Critical Studies on Terrorism, says that the internet has provided people with minority-held beliefs a space to connect with other like-minded people in a way that can normalize their world view.”There are fears that if you have a small number of people with same ideas, the ideas feel more legitimate and widespread than they actually are,” Jarvis says.The fact that the document is laced with internet in-jokes, references and memes underlines that many white supremacists are radicalized by socializing with each other online, he adds.The manifesto also sarcastically credits relatively anodyne video games, such as Spyro the Dragon and Fortnite, with causing the attackers’ extremism — seemingly to undermine the popular perception that only violent gaming culture has a radicalizing effect.”I’m skeptical that video games play a direct role in terrorism attacks,” says Jarvis. “But the populist culture that anyone consumes shapes how about they go about their daily life.”Gaming culture was certainly present in the undertaking and stylization of Friday’s murders — the gun visible in the shot was visually reminiscent of first-person shoot ’em up games. 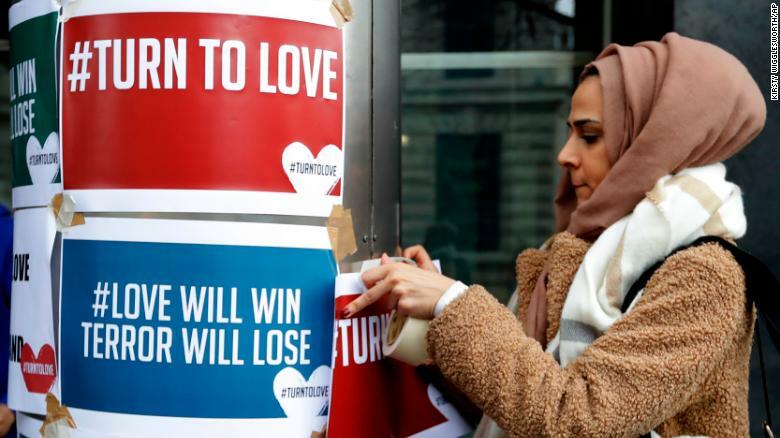 A demonstrator hangs banners from multi-faith group ‘Turn to Love’ during a vigil at New Zealand House in London.After Friday’s attack, Mia Garlick, a spokeswoman for Facebook New Zealand, said videos which appeared to show the Christchurch shootings had been taken down from the platform.”New Zealand Police alerted us to a video on Facebook shortly after the livestream commenced and we quickly removed both the shooter’s Facebook and Instagram accounts and the video,” the spokeswoman said.But, hours after the attacks, CNN could still find the videos on social media platforms including Twitter.Tom Chen, a professor in cyber security at City University in London, notes that the European Commission was pressing social media companies “to take down terrorist propaganda within one hour.” There are threats of possible future fines for noncompliance, “because most of the distribution happens within the first two hours of uploading a new video,” he adds.